Remember the golden days of air travel, when martinis were served from takeoff to landing, and flight attendants wore mini skirts and go-go boots? I don’t either. 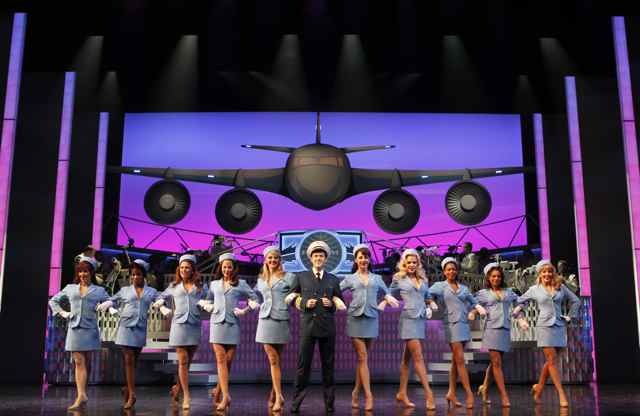 But the new Broadway musical Catch Me If You Can captures that era perfectly, with cheeky humor, sixties singalongs and dance numbers performed in toe-tapping unison by flight babes in powder-blue. The evolution from book to film was inevitable. But could it go successfully from screen to stage? Oh, yes. All the ingredients that made the movie a splash – a man on the run; international intrigue; the swinging sixties – play out in grand style on the Broadway stage. The story itself has become legend: Frank Abgnale, Jr., the consummate con man, managed to pass himself off as a jet pilot, a doctor and a lawyer – all before the age of 21. Along the way, he led detectives on a cat-and-mouse chase across the world. If you saw the movie, Leonardo DiCaprio is seared in your mind as the lead character, but Aaron Tveit is equally charismatic on Broadway, nimbly staying out of reach of the “straight-arrow” FBI agent who’s trying to catch him if he can. Our recommendation? See it if you can.